V.com weekend vote: Which name would you take down to make way for another: Bach, Mozart, Beethoven, Schubert or Wagner? This week we've been in Chicago, where I had the unexpected privilege of playing the "Vieuxtemps" Guarneri del Gesù (price tag, $18 million) while visiting Geoff and Suzanne Fushi at Bein and Fushi. You will hear more next week about my violin encounter, but I today I'd like to give you a vote, inspired by a walk up Michigan Avenue, as I was leaving the shop late in the afternoon Wednesday. 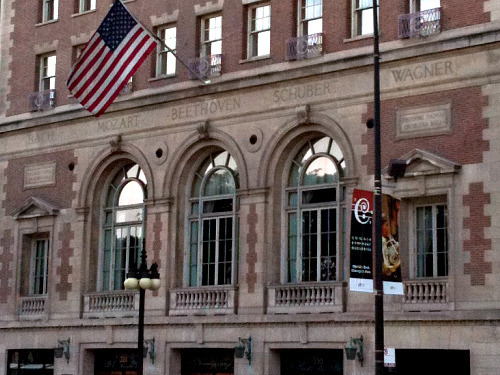 I smiled as I walked past Orchestra Hall, home to the Chicago Symphony and Civic Orchestra of Chicago (I played briefly in the Civic Orchestra, so I can say I played at Orchestra Hall!). As with many older concert halls, the building has the names of several important composers etched on its face, in this case: Bach, Mozart, Beethoven, Schubert and Wagner. As I was staring at these names, Robert peered over my shoulder and asked what I was already thinking about, "Which of those composers would you take down, if you could, and who would go up instead?" Good question! And so I pose it to you: Please vote for the composer you would eliminate, and in the comment section below, tell us whom you would nominate to be up there instead. You are welcome to simply post a name, but if you have some thoughts on the matter, please tell us about them. Also, let us know if you would simply leave things the same. I'll tell you later which one I'd vote off the island; I don't want to influence the vote! I would choose to put up Brahms instead of Schubert, in keeping with the all-German theme. Or if non-Germans are allowed perhaps Tchaikovsky, Prokofiev, Sibelius or Dvorak. edit: yes, I'm aware that several of the guys I called "Germans" are actually Austrian. I should have said "Germanic". Besides Mozart referred to himself as a German during his lifetime. Sorry if I upset any Austrians with this, not my intention. Michael, but Mozart was not a German either. I'd take down Wagner. I'd take down Wagner and put up Brahms, given the choice. I agree with some of the previous commentors. Take down Wagner and put up Brahms or Tchaikovsky. I'd love to see the look on Wagner's face when he gets demoted. No serious musician can dismiss Wagner from the greats. No serious musician can place Schubert with the others. Like I said, I'd replace Schubert with Brahms, but I see that Wagner is becoming the least popular now. Why so little love for Wagner? I've always considered him an extremely important composer for his quality and quantity of work. Not to mention his harmonic innovations which have changed and influenced composition long after his lifetime. I'm not suggesting that people have to agree, this is all subject to opinion. I'm just curious about people's reasoning. And I would replace Schubert, who was a true genius, with Joseph Haydn, who brought the music much more foreward than Schubert did. In fact Haydn should be up there before Brahms. The only criteria for removal should be gross mis-conduct or believing the earth moves around the son. Let them die a natural death when the building is demolished. Vivaldi would get my vote to be included on the building. Indeed, it looks like someone made a grand effort to vote out Beethoven, as I doubt a big group of us would do it! But this will result in progress, we've been thinking about using some polling software that Robert came up with, and we'll do that. It will only allow registered members to vote; the Twiigs allowed anyone to vote. I have thought of a new idea that I like: they just need a new wall, and to add five new names! Politics is not a valid basis upon which to make a judgment about the quality of a composer's work. Wagner must stay for the sheer weight and influence of his contributions. How can anyone vote off the creator of the "Tristan Chord"?! :) Wagner is one of the central tent poles in the musical firmament. Remember that Jascha Heifetz, himself no slouch when it came to issues of antisemitism, was willing to sacrifice his bow hand and, potentially, his del Gesu to make that same point about the transcendence of music. Yes, such a stand puts good people in the same company as Hitler, but no one can argue that he possessed a smidgeon of genuine appreciation for music as anything other than a propaganda tool (though he apparently harbored a secret hobby of playing Heifetz records, among other Jewish musicians, so go figure). I would remove either Schubert or Mozart, as neither is what I consider to be a musical revolutionary - i.e., those composers who rearranged the molecules of musical composition and exploded the boudnaries of what people thought were its limitations. It actually kills me to say such a thing about Mozart, whose oeuvre is the most infallible series of masterpieces of human expression ever conceived. He single-handedly argues for the existence of God. Yet, based on the standard of the true musical revolutionary, he must cede his position, as he pretty much operated within the confines of the classical compositional idioms of his day. Much as I admire Vivaldi, the vote is about symphonies and the composers who advanced that particular art form I presume. Haydn made a tremendous contribution in his time. At least as much as Schubert, is that not true? Poor old Ludwig Van. A Clock Work Orange did him no favors. He is coming in last, two furlongs behind the field. This is an upset for the bookies. who is voting against Bach? I think thats the last person to vote against in my opinion! By the way, I at first thought "who should stay on the wall" so I voted Schubert, then I looked at the other polls.. I started to realize while nobody voted for Mozart! I would like to add Liszt! O hold on.. didn't Paganini compose his Caprice's? My musical knowledge is quite poor.. If Paganini is a composer, up with him! Paganini is great....for the violin...but I think an all around composer should go up. Like the best 20th century symphony composer: Shostakovich. I don't listen to wagner much either...but I will play some of hime this year so....here we go? I'm surprised no one said "Up with mahler!!" I voted for Wagner. The people that voted for Bach and Beethoven should be booted from this board :-) What kind of mushrooms are they smoking anyway? It's hard to believe that so many people voted to take Bach and/or Beethoven down. Was there a computer error in the vote? I dare anyone who voted against Bach or Beethoven to tell us why. Then we might do what Smiley, in his comment just before mine, suggested to them. I wonder if people are voting to boot Wagner because they aren't familiar with his work or because they don't like it? Listen to Siegfried Idyll. Listen to the complete Ring cycle. Have a look at the violin parts. It's like a completely different world. Strange, I bet tomorrow Bach will overrun Beethoven in votes.. I would take down Wagner and put up Brahms. I am sympathetic with the vote for putting up Tchaikovsky, too, but it's got too many letters . . .
Like some others, my wanting to boot Wagner has to do with a personal dislike more than musical significance. But I think that for putting a name up on a wall, something that you have to look at every day as you drive or walk by, some personal feelings can be allowed to come into it. I couldn´t take any of those down. I am not a big Wagner fan in general but he was a very important composer and very influentinal (not to mention he was one of the firts composers to use Norse mythology in his works). I´d insteda put up a whole lot more of names including: Strauss, Prokofiev, Stravinsky, Shostakovich, Grieg, Sibelius, Tchaikovsky, Saint-Saens, Handel, Haydn an so many others. Appalling. There is only one likely candidate for removal. There are several candidates to replace the meretricous Schubert but no one can replace any of the others. We could consider Brahms, a great composer but a limited influence. We could also consider Debussy both great and influential. A case could be made for Stravinsky. Haydn is also a far more worthy than Schubert. If you are a professional musician and you chose anything but remove Schubert or remove no one then you have only yourself to look for to see the decline of classical music. Am I being judgmental? You bet your sweet bippy! This is an interesting thought, if this were "vocalists.com" instead of violinist.com nobody would think to remove Schubert. I actually think it would make some sense to replace Wagner with Mahler. Wagner's importance is without question, but how often do you hear Wagner in a symphony orchestra performance (I don't think I've ever heard his symphony)? Replacing Schubert also makes sense as much as I love his music. For the names to replace him Haydn and Brahms would be most likely...Berlioz and Shostakovich also have some logic to them in my mind. I'm with Corwin all the way on that. Very well put! For those of you who don't like Wagner I invite you to listen to the following gem. If you really don't like Wagner after listening to this clip of Siegfried Idyll then I don't know what to say. The names on the wall looks like a progression of composers that handed over a baton to the next generation. Brahms for Schubert would make it a major scale, otherwise we are looking at a minor scale. Other great names mentioned does not fit into this pattern and a new wall will have to be erected for them. It would be interesting to read what the original votes were when the wall was erected. Who are these people voting Bach off??? Boot Wagner, and okay, I understand the point about Schubert although it was well put, that Schubert is a vocalist's composer and would never be booted under those circumstances, the same way classical musicians would never boot Bach (which makes it very easy to spot the attempts of lurking trolls). Agree with the thought of adding Haydn, although he didn't spring first to mind, but of course, he was HUGE and left a tremendous impression on future composers. And yes, there's Brahms, too. How could he have been missed?! But if I could only pick one, it would be Haydn in, Wagner out. My argument is that what I've heard of his music is all the same - big, booming, bellicose. Lacking delicacy. I would LOVE to have something recommended to me, that would show a delicate, ethereal touch. And on that note, on wall #2, I would want Schumann. Such a delicious, otherworldly touch to so much of his music. Haunting. Wagner haunts me - only in the wrong way. >...we've been thinking about using some polling software that Robert came up with, and we'll do that. It will only allow registered members to vote; the Twiigs allowed anyone to vote. Would it allow you to see if a registered member voted 20 times, as well? That would be quiet telling. Allowing the general public to vote explains the low ratings for Bach and Beethoven. I can't believe that musicians would make such awful choices. Please, please, set up the poll so that only registered members can vote. Pauline this is only a fun game and no one is going to remove any names from the wall. I have that on good authority. Having only registered members vote, is no guarantee that the vote would suit your ideas or that of anybody else. Any member could vote fifty times if he feels strong enough about a certain issue, and I suspect that is what possibly happened. If any non member is interested enough to visit V.com and vote, good for him or her, we may have a potential violin enthusiast. You are free to rain on my parade.